Friends Day Video is Came .. 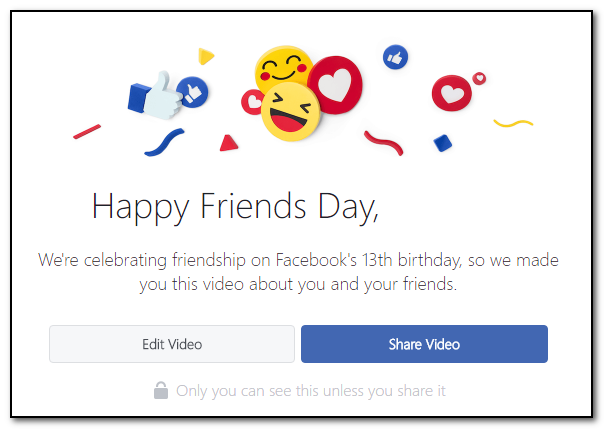 If you want to show your Friends Day video to Your Friends then click on Below link it will automatically generate a video for you and you can saw the video there if you want to change some photos in the video then simply click on " Edit Video " otherwise Share the video on your timeline. After selecting photos just click on share the video then It will Take few minutes and give a Video to You. and Share to your friends. Select those Photos which represents your Friendship shown in that Video .. The Edit option which is used for edit the video which Photos you need to use in the video and the best Friendship Photos you can put on it .. If you satisfied for this post. please comment your opinion about my website .. Hurry Up !